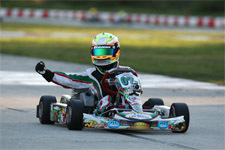 After earning double victories during the Formula Kart weekend of the 2013 Formula Kart Productions Florida Winter Tour (FWT), karting hot shoe Anthony Gangi Jr. claimed yet another win this past weekend. 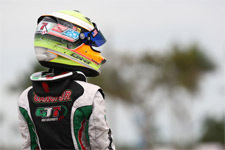 Again taking on the revamped Palm Beach International Raceway (PBIR) in Jupiter, Florida, Gangi Jr. would this time be on track for the Rotax Max Challenge weekend. 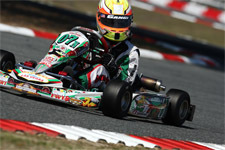 Competing against 43 drivers in a competitive Rotax Mini Max class, the GT7 Motorsports pilot would switch from his Votex TaG Cadet machine to the Rotax powerplant for the week's events. Taking on top talent from around the world, as the FWT continually draws entries from upwards of 28 countries, Gangi Jr. would endure rain soaked conditions for Saturday's wheel-to-wheel action, but rise to the occasion on Sunday to turn his efforts around. With the Rotax events holding both qualifying sessions on Friday for the weekend's racing action, Gangi Jr. would need to be sharp for the first official on track activities. Clocking second quick in both sessions, the 2012 US Rotax Grand National Mini Max champion would be in excellent shape with his front row starting positions for the wheel-to-wheel action to come. 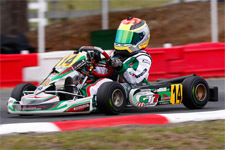 Changing weather patterns on Saturday would put the GT7/TonyKart team and driver to the test. With the morning's warm-up session held in the dry, rain would move into the area by the prefinal as Gangi Jr. fell to fifth in the wet. Further plagued by the wet conditions, the young gun would post a disappointing DNF in the day's final. Gangi Jr. ran as high as third until contact from behind ended his day after only completing two laps. Sunday proved much better for Gangi Jr., as the 11-year-old would be hard to beat all day long. With perfect weather conditions and no rain in site, Gangi Jr. was back to his winning ways. Scoring the prefinal win by just under a second, Gangi Jr. would lead the field from the pole position for the day's final. Engaged in a tight battle in the early stages of the 14-lap main, Gangi Jr. would make his way back to the point by lap four and was untouchable from there. A 5.877 second margin earned Gangi Jr. his fourth victory in three races in 2013 FWT action, as well as fast lap honors in the final race. Anthony Gangi Jr.'s success would not come without the support and hard work of his tuner and driving coach, Chris Perez, and engine builder Daniel Lambert (Disco Dan). Additionally, Gangi Jr. would like to thank Sargeant Motorsports for all their help and support along with sponsors Millwork Solutions, Holeshot Drive Systems and PKT Axles. 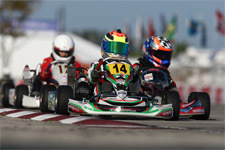 Gangi Jr. will next return to Florida Winter Tour action February 16-17 for the Formula Kart rounds and February 22-24 for the Rotax divisions at the Homestead Karting Complex, located on the grounds of the Miami-Homestead Speedway.